ThermaVein offers the instant, safe and permanent removal of facial veins, medically referred to as “telangiectasia”. There are a variety of more commonly used names to include thread veins, spider veins, rosacea, vascular blemishes and spider naevi. A typical treatment should take no more than 40 minutes, immediately after this time the patient will see a significant improvement in their condition if not a total eradication. The treatment is very visual and you will notice the veins disappear as they are touched with the pen. This leads to a real “Wow!” response the first time the client looks in a mirror. This is a stark contrast to alternative treatments which can take 6-8 weeks and many sessions. We appreciate that other treatments require up to 8 weeks recovery, during which time your actions can be severely restricted. As ThermaVein uses a very different technique the downtime is less due to the localised area that it treats. You should expect redness and slight scabbing for up to three weeks but you will be able to return to work immediately after the procedure is completed. In order to increase the speed of recovery, we provide K-Ceutic healing cream can be used. 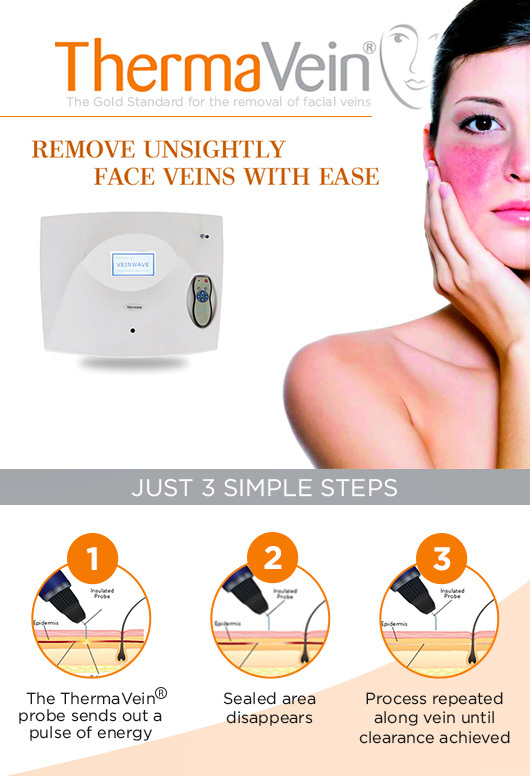 Spider veins, Thread veins, Telangiectasia, Nose Veins, MiliaFacial redness, Blemishes, Skin Tag, spider naevi and depending on the experience of the user other conditions are possible. Some people need more treatments than others, so we have designed a pricing plan to suit everyone’s needs. We charge €200 per session with the average session lasting 30 minutes. Most people will need only 1 treatment but others will require two our 3 treatments to eliminate unwanted veins. Contact us at our Dublin clinic 01 6769810 or Adare Clinic 061 395410 to arrange a consultation.